Looking over the treetops from this South Buckhead highrise is a spectacular experience, and some of the units have large polygonal windows to for a more captivating view. You'll find some of the best values for a high-rise home in Buckhead at the Parklane. Parklane on Peachtree offers a wide variety of homes to meet the needs of your lifestyle… and your budget. Studio, one-bedroom, two-bedroom and even three-bedroom penthouse homes are available. Have any comments or questions about Parklane on Peachtree? Ask your question and/or share your thoughts about this Building. Hi Darrell. Let me check with the property manager to see if the have the floor plan for the 2 bedroom/ 2 bath properties on file. I will be back in touch! 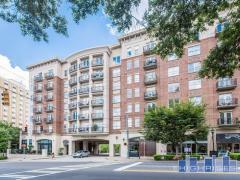 I'm in the market for a 1/1 unit in Buckhead and would love to hear feedback from current owners about life at Parklane. I am leaning heavily towards buying a unit in this bldg. A (1/1) but might be able to get by with a studio. What are the noticeable differences a (2/2) to a studio? A 2/2 is a little bit out of my price range.